We are less then a week away from the commencement of the 2017 golf season, and the course is slowly coming along. Although everywhere around us has had great growing temperatures these past few days, the typical north wind off of the lake has kept us quite frigid at times. There are quite a few items to tidy up from the construction in the fall, some of which may take us some time to get to. Of course we have the ultimate goal of having everything buttoned up by the 1st of July, but we also need to be realistic in our expectations....there is a lot to get to! So without further adieu, here are some photos and explanations of the various items to know as you arrive. 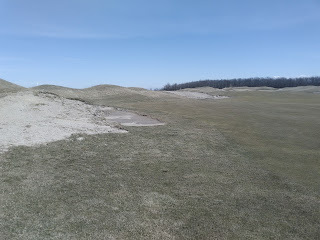 This is the former bunker on the left side of 16 green. 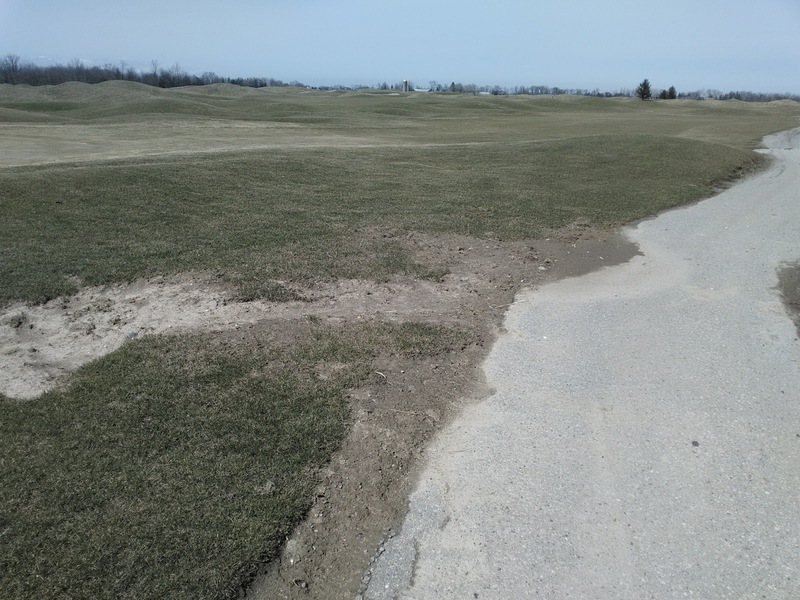 As is always the case with dormant sodding, you are at the mercy of mother nature and unfortunately, we did have an early snow fall in December, which shut down our sod farm in Strathroy. 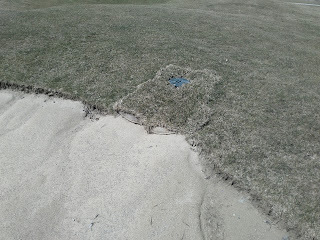 This resulted in some partially complete sodded bunkers such as this. This entire area will be painted GUR, and we ask that you kindly refrain from any foot or cart traffic until all signs are removed. We will finish sodding these areas as soon as possible. The picture above shows the apron on #9, which was the site of an exploratory drainage dig, and correction. 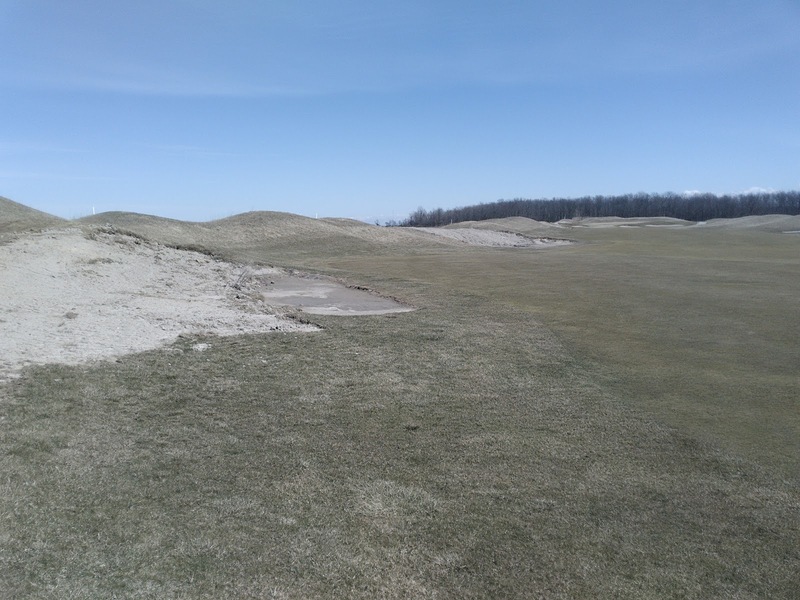 There are a couple of spots which settled over the winter, and will need to be re-graded. This area will be painted GUR as well. This is the fairway bunker at the centre of 8 fairway, To say that it is in rough shape, would be an understatement! As you can see, the tile itself has heaved over the winter, as well as all of the pea stone that would have been within the drain line. 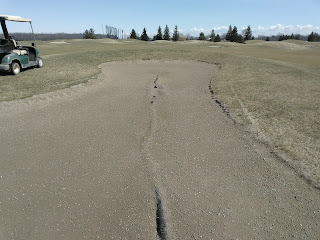 It is hard to tell from this photo, but it is more of a gravel walkway than a sand trap! We will also mark this area as ground under repair, and will more than likely have no choice but to completely overhaul this bunker. 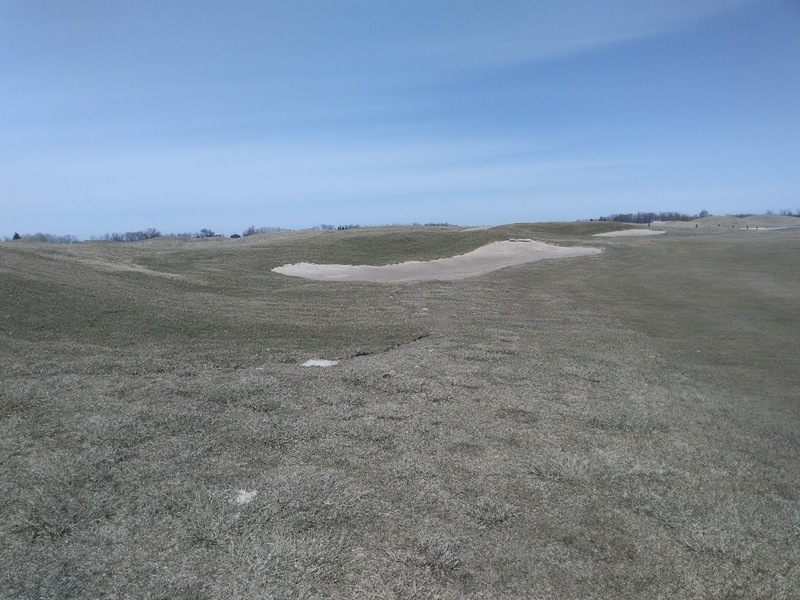 As a general statement, the fairway bunkers are in need of some TLC, but will be a little ways down the priority list as we try to recover the most prominent bunkers first. There are numerous scars such as the one above near the left side bunker on 7. 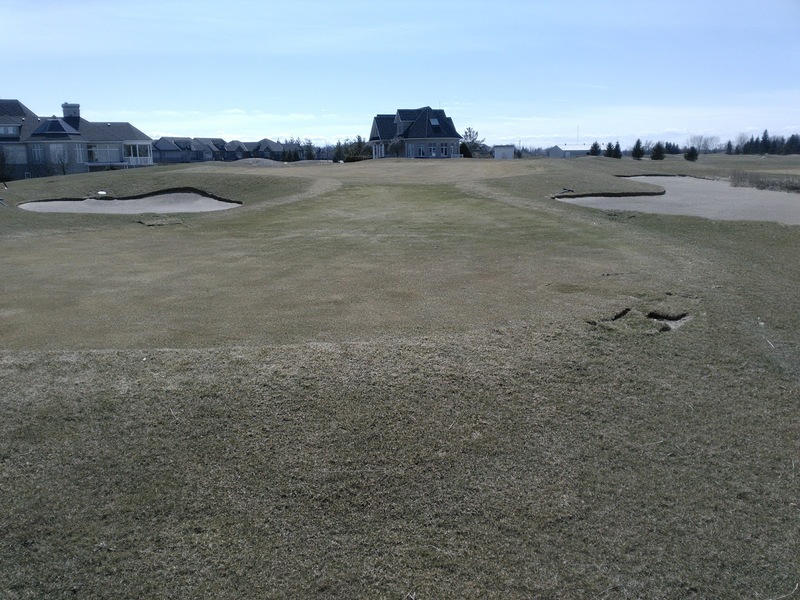 For the most part, these were areas that we encountered tricky drainage issues, and required further work. You will see these areas painted GUR, with the plan to recover these areas via topsoil and seed. These areas are imperative that you keep foot and cart traffic out of, as we heal these wounds. The fairway bunkers on #6 have been demolished! This means that they will remain GUR, which of course is no different than how they were from the majority of 2016. We will be devising a plan as to how we will resolve these issues, but for the time being, they will remain GUR. The new fairway bunkers on #3 are wonderful, however, they do require some time for the sod around them to knit. The bunker itself is playable, but we ask that you keep all traffic off of the sod for the time being. The same can be said for #5 green, #6 green, #8 green, #10 green, #17 green and #18 green bunkers. Almost all of the new bunkers have seen the addition of a bunker cleanout port. What this port is designed to, is to allow us the opportunity to flush the bunker drainage system out periodically, to ensure that they do not clog. This will hopefully extend the life span of our bunker drainage system, keeping the bunkers operable longer. 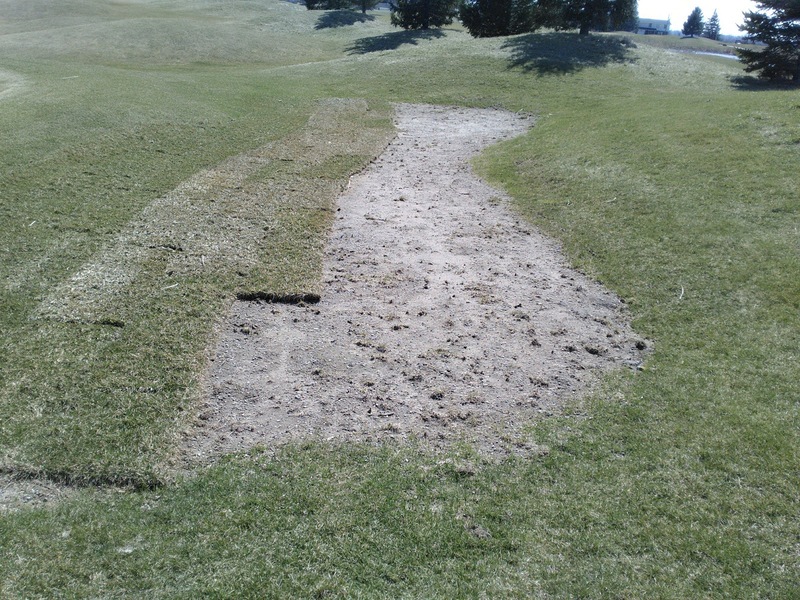 This has however, created the areas which you see above; a maintenance access cover, with bagged soil acting as a bunker board for the edge of the bunker. I am a bit hesitant on the state of these bags, and am unsure as to how they will react in the next month or two. I am hopeful that the turf roots will infiltrate these bags, and cause them to stabilize the wall of the bunker, but cannot guarantee this; they may alternatively rot away, causing some of the soil to bleed into the bunker. As we wait and see how these react to turf growth, I will ask you to keep off of them with any traffic, but to also keep sand raked up to the edge of the bags. I believe if we keep the sand pressed up to the bags from the interior of the bunker, it may provide enough pressure to keep the bags from splitting. The Turf Department will soon be producing an instructional video on how to rake our bunkers, in an effort to standardize the methods used by both golfers, and turf staff while maintaining our new traps. Keep an eye out for this soon. I am hopeful to get a few first cuts down on some turf areas prior to opening day, but will monitor the situation following the rains over the next few days. As always, feel free to contact me if you have any questions. Thanks for reading today's novel!